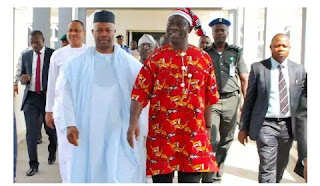 The All Progressives Congress (APC) has stated that Senate President Bukola Saraki can’t declare vacant the seat of Godswill Akpabio for defecting from the Peoples Democratic Party (PDP). The Reformed-APC had call on the Senate President to declared the sit of Akpabio vacant for joining the APC. In a statement Sunday by its spokesperson, Yekini Nabena, the ruling party emphasized that the APC would not normally “respond to the so-called, ‘Reformed All Progressives Congress (rAPC)’ because it is neither a duly-registered political party or a faction as it labours to sell to the public”. “The real issue remains our clear position that the Senate President honourably steps down or be impeached. Dr. Saraki’s ‘vote of no confidence’ which the so-called rAPC alleges has since been passed going by our Party’s rejection of his leadership of the Senate.